The plans, presented last night at the West LA Neighborhood Council’s Planning and Land Use Committee, call for a four-story project, with 157 units that include 16 low-income apartments. There will be nearly 45,000 square feet of retail, though committee members voiced worry that a big box retailer, like CityTarget, would move in and bring on a traffic apocalypse (lots of underground parking is planned). CIM reps said there are no plans for something like that, but the committee wants the retail spaces broken up into smaller shops, as well as more open space and wide sidewalks. There’s time for adjustments as the project, designed by Gene Fong & Associates, is in the very early stages. No word on what CIM will do with the Chrysler parcel, but I ‘m sure it will be equally horrifying. 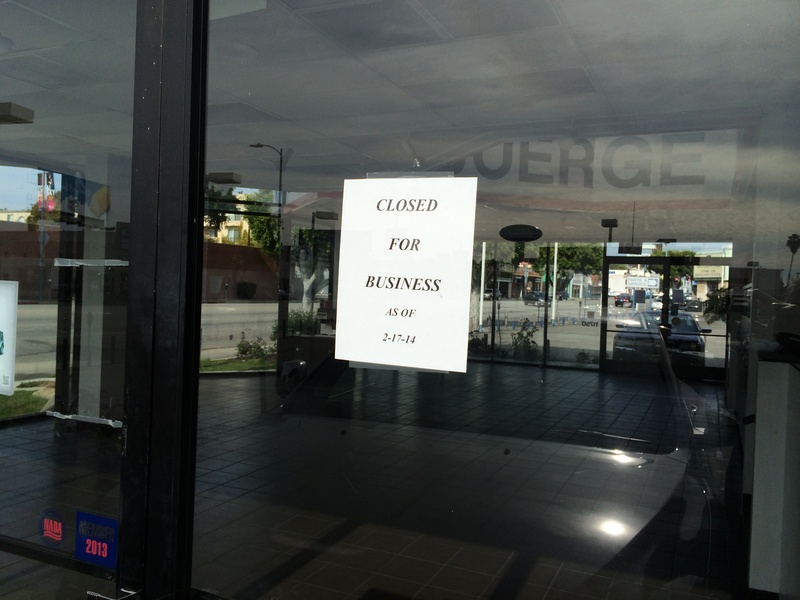 Just a couple weeks after Buerge Jeep-Chrysler-Dodge-Ram closed forever, the other Buerge enterprise, Buerge Ford at 11800 Santa Monica Blvd in West LA, also shuttered. The sad sack building and nearly empty parking lot tell the story. Unfortunately, it comes as no surprise that both dealerships tanked. The clueless management and hapless sales staff – hallmarks of the Chrysler store – were only marginally better at the Ford store. I shopped at Buerge Ford a few times over the years and I always came away with the feeling that the salesman seemed depressed and resigned to losing a sale. The test drive inevitably consisted of a short, four-right-turn-course, with busy Santa Monica Blvd as the “rewarding” home stretch. This kind of useless short route is all too typical of dealer test drive routes in L.A. The physical facility always looked dated and in need of attention. Whether it was a leaky roof or just the cramped showroom, the whole place should have been torn down and replaced years ago. I assumed that there just wasn’t enough money to do any upgrades. These days, owning only two small dealerships isn’t enough mass to compete with the large dealer groups that dominate the LA market. The tiny physical footprint occupied by Buerge Ford also made any major expansion a challenge. And any hint of large-scale development is met with opposition from well-financed NIMBY neighborhood groups. There didn’t seem to be any hurry to dismantle the service bays. The only difference from closing the Chrysler store is a referral to another dealer. 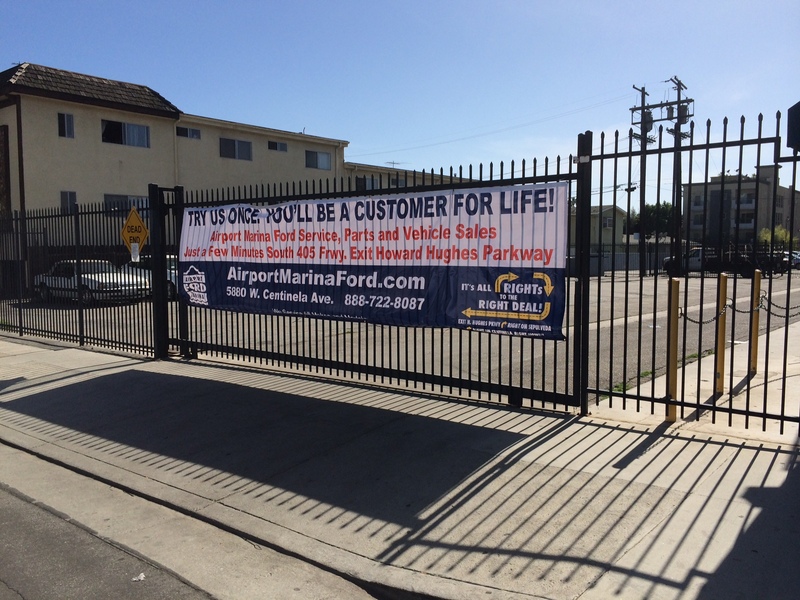 Big banners at Buerge Ford point bewildered customers to Airport Marina Ford at 5880 W. Centinela Ave, not far from LAX. For many, that’s just too far out of their daily orbit. Santa Monica Ford will likely pick up most of the business. 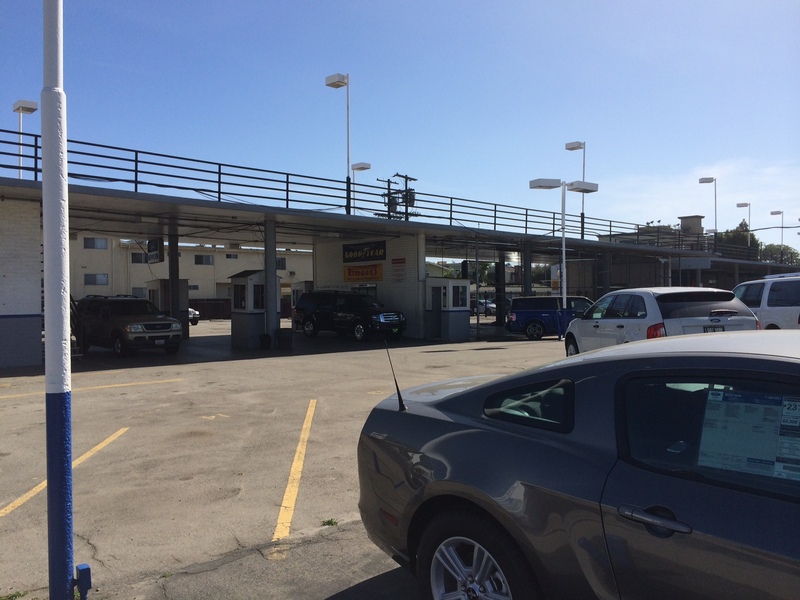 Buerge Ford Customers are referred to Airport Marina Ford near LAX. Interestingly, a few remaining cars were marked to go to different Ford dealerships. This pathetic-looking Fiesta was marked to go to Santa Monica Ford. I wonder how much longer it sat before it was driven a couple miles west to its new home. This Fiesta was tagged to go to Santa Monica Ford. 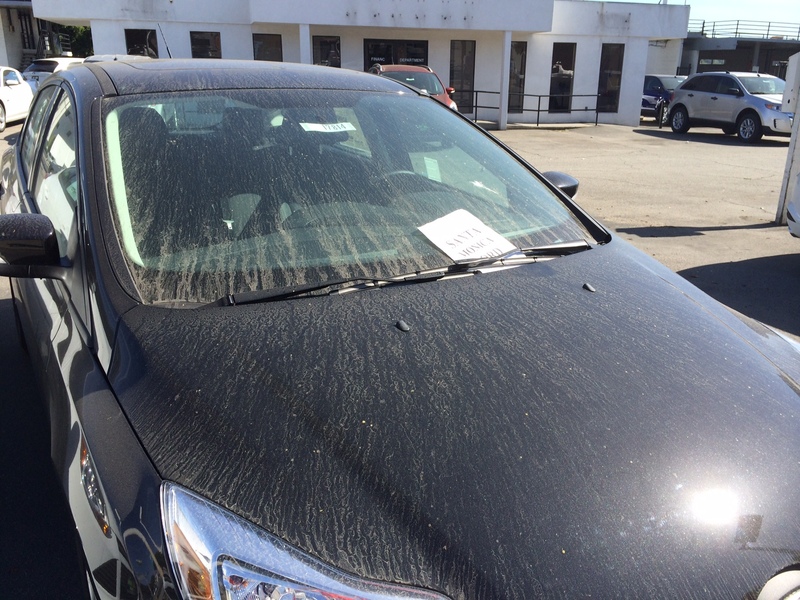 The thick layer of dust and wilted paper tag are a clue that the car has been sitting like this for at least a week or two. Both Chrysler (including Jeep, Dodge and Ram Trucks) and Ford have numerous blockbuster models including the Ford F-150 pickup truck and the Jeep Grand Cherokee. There should be a very strong market in wealthy West LA for both brands. 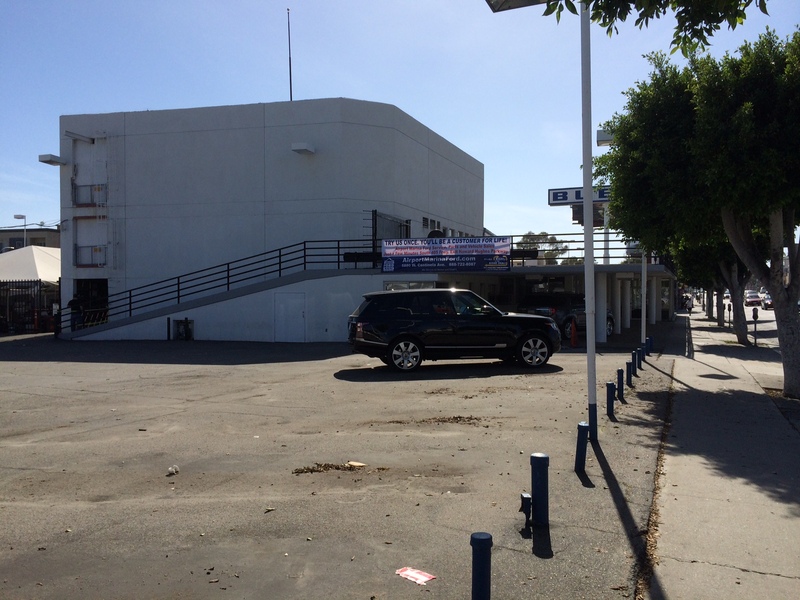 At least for Ford customers, there are two stores (Santa Monica and Airport Marina) in the same area 310 code. No such luck yet for us Chrysler Group owners (I own a Dodge Charger). Buerge Ford is one of the longest continually active Ford franchises in California and the United States. We trace our roots back to 1915 in Westwood. 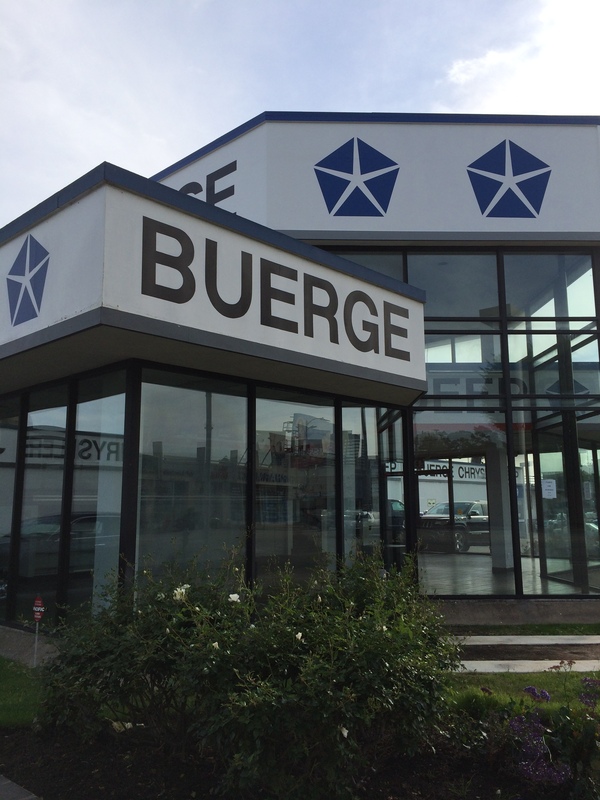 Buerge Ford has been selling cars and trucks, servicing cars and trucks, and selling parts for cars and trucks for over ninety-three (93) years! On top of that we are on Route 66 – the “mother road” of the West! Located just under a mile from the 405 Freeway at 11800 Santa Monica Boulevard. 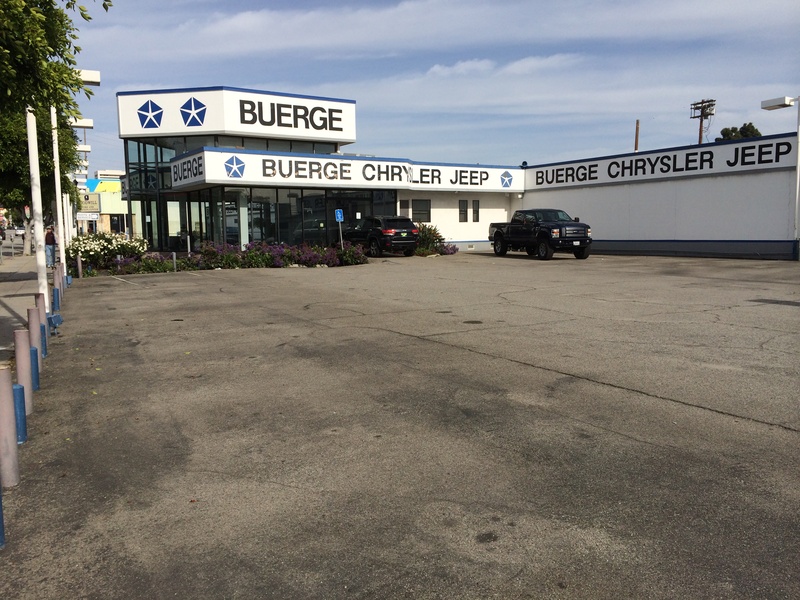 Buerge Ford and Buerge Chrysler Jeep are family run local businesses that have sold and serviced new Ford, Chrysler, and Jeep cars and trucks for decades. We’ve got grandfathers and grandmothers, fathers and mothers, who bring their children and grandchildren in for their first new car or truck. We have families and friends who have purchased cars here for generations. 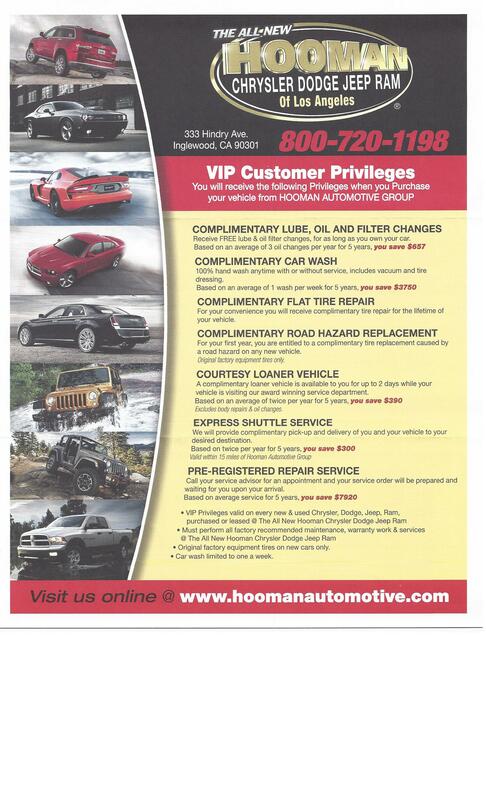 We offer superior service and extraordinary deals for all automotive needs and transactions. As an example, Blue Oval is the Ford Motor Company’s exclusive measuring tool to seek out and reward the best of the best – the best Ford and Lincoln Mercury dealers in America and California. (Like the J. D. Power Awards). Buerge Ford has been Blue Oval Certified every year this customer satisfaction program has existed. In the internet age, I’m not sure that being “Blue Oval Certified” means much. I don’t know anyone who has a “personal relationship” with a dealer or car salesperson. You’re more likely to have a business relationship with the service department than sales. 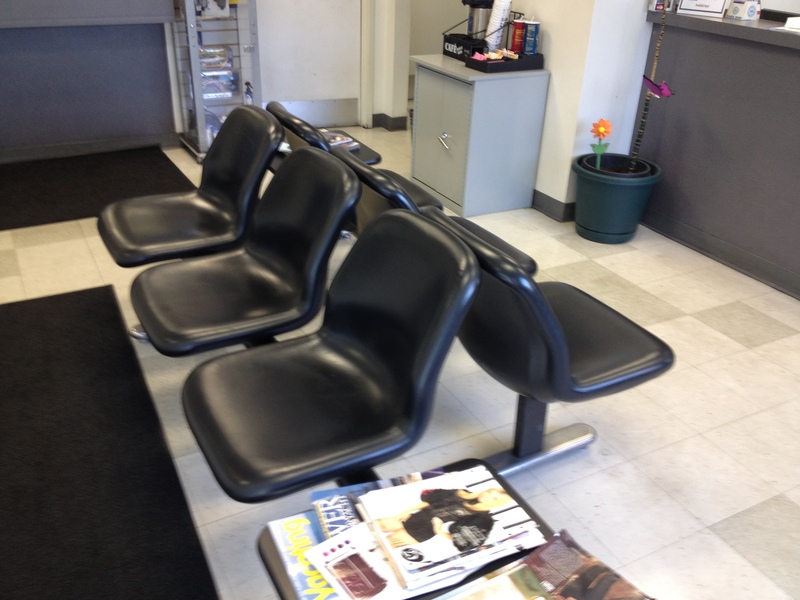 For most, going to a car dealer for anything has all the appeal of a stint in a dentist’s chair. The only silver lining for the Buerge family is that the real estate – two full blocks in West LA – is probably worth a small fortune. Buerge Ford lasted for 99 years. It’s a shame it didn’t make it to 100 in 2015. I’m sure some equally craptastic development will be planned for the Chrysler block. 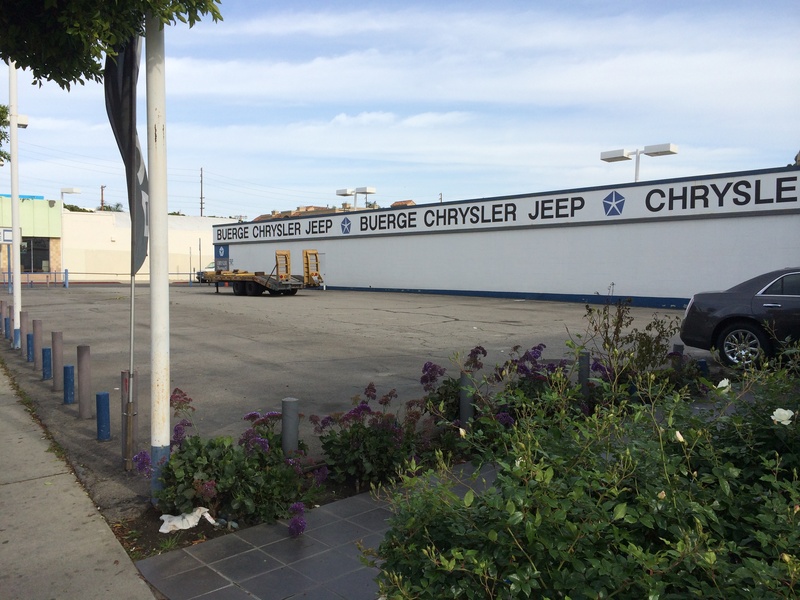 Just two weeks ago when I drove by Buerge Chrysler-Dodge-Jeep-Ram in West Los Angeles on Santa Monica Blvd., the lot was full of cars. Fast forward to today, it’s a ghost town and fork lifts are hauling out service equipment. 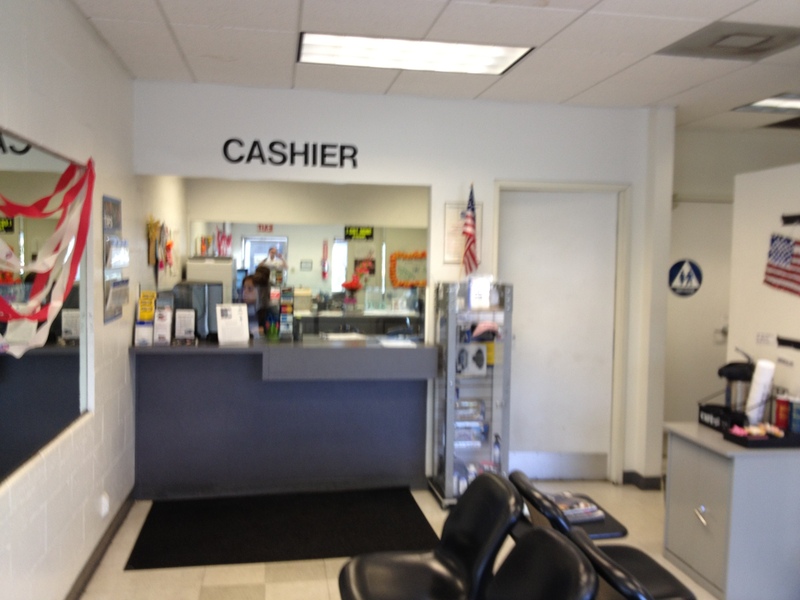 Whatever valuable tooling existed in the service department was being carted out. Perhaps it had been sold or it was being repossessed by a bank or leasing company. What happened, I don’t know for sure, but I can speculate: Terrible customer service finally put the nail in the coffin. The tiny showroom was a humbled design that was never updated. It could have been renovated, but the owners didn’t invest much in the facilities. I’ve shopped at Buerge before and I’ve never had a good experience at this dealer. And I know it wasn’t just me. Many of the Yelp reviews were brutal. I remember my last visit to the showroom. There were no sales associates anywhere to be seen – not even a receptionist. And there were three other customers wandering around looking at the cars on the showroom floor, wondering if anyone was going to bother to talk to them. When one sales guy showed up, we had to let him know who was waiting the longest, like we were at the prepared foods counter at Gelson’s. Naturally, I knew more about the car than the salesman – not surprising – but this guy seemed particularly clueless. It must have been a horrible, depressing place to work. The lot was very small by modern standards, but there was no place to grow. The rear abuts residential property and the dealership already occupied the full city block. The original lots just weren’t very deep. 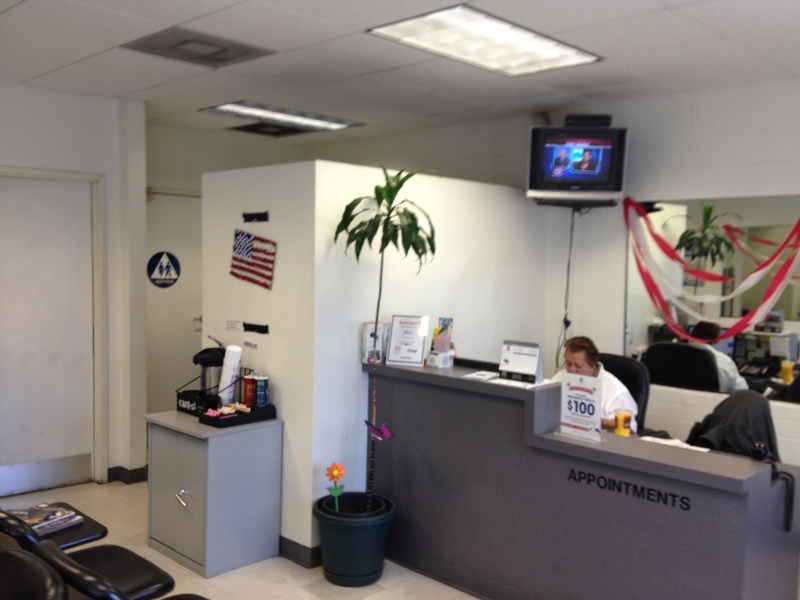 After I purchased my 2012 Dodge Charger from another more responsive dealer, I took my car to Buerge for service as it is the closest dealer to me in West Hollywood and I can ride the MTA 4 or 704 to a stop one block form the dealership. The service people never found the electronic gremlins that plagued my outside temperature gauge (constantly wrong) or why the climate control system didn’t properly sense the cabin temperature, but I was horrified by the customer “lounge” which hadn’t been updated since the building was built, probably back in the 1970s. The ceiling tiles were stained from ancient water leaks. The coffee “station” could have come out of an episode of The Office. The windowless room was truly soul-sucking. I took these pictures about 2 years ago. Note the ancient TV. And check out that fantastic coffee station. No expense spared, right? It’s like they bought the seats at a surplus auction from a defunct Greyhound Bus station. It’s hard to see, but there were water stains on the ceiling tiles. Like the way the owners ran the business, the “closed” sign was a simple notice with no information or explanation. Maybe they lost their lease? Maybe the real estate was too valuable for a poorly-performing business? Who knows? This is bad news for Chrysler as this leaves the company with no store in Metro Los Angeles — the same problem plagues Chevrolet. My choices are now Van Nuys, Glendale, Downtown LA, Inglewood or San Fernando. None of them are on a transit route and none are convenient. 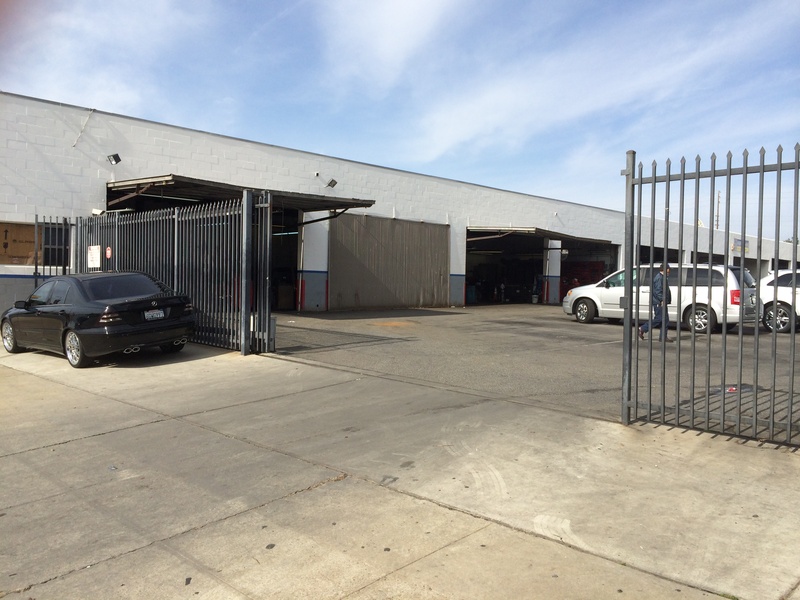 There’s a huge market for Chrysler-group vehicles and factory service in Metro LA. Perhaps another dealer group will take up the franchise in Santa Monica or even Mid-Wilshire. Jeep is a hot brand, as is Ram. Just because Buerge finally tanked doesn’t mean a well-run group can’t fill the vacuum that now exists. Any takers? I received a flyer in the mail from the “All-New” Hooman Chrysler Dodge Jeep Ram of Los Angeles – NOT conveniently located Inglewood. This is apparently the replacement for Buerge, but I wonder why I got a flyer for my minivan but not my Charger. Odd. 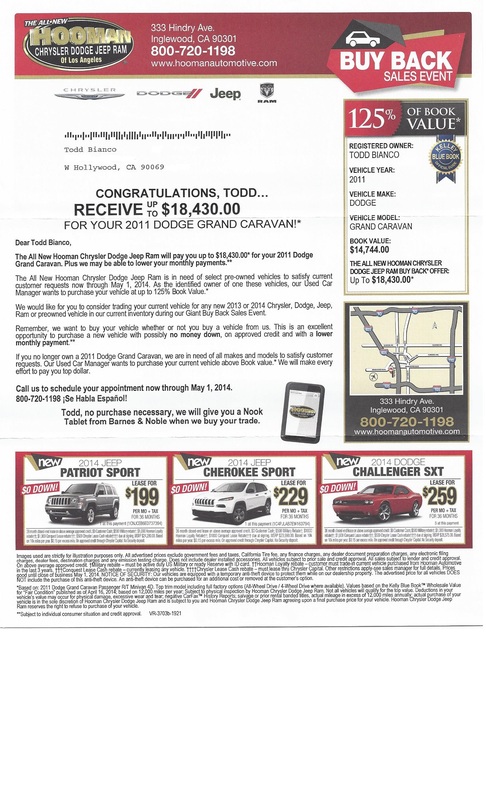 However, I won’t be taking either my 2012 Dodge Charger or my 2011 Dodge Grand Caravan there for service. It looks like I’ll stick with Crystal Chrysler Jeep Dodge Ram Fiat in Cathedral City.